My Favorite Game Of. Number 18. 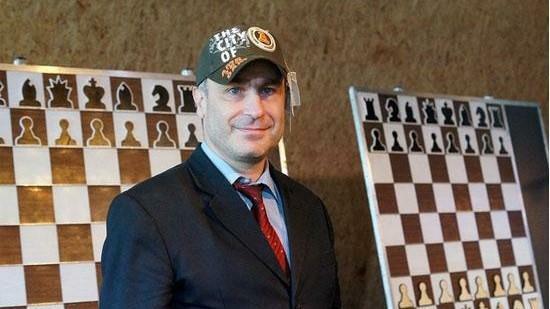 Vassily Ivanchuk. Well, I am working on one of my big history blogs about a forgotten figure from chess history at the moment, but there has been a noteworthy day to take notice of! For anyone who hasn't noticed it, I will point you in the direction of this article from UAArtur and Alexander Matlak. to find out what I am talking about, and to enjoy some wonderful chess. In the comments there you will find a few of my thoughts on my favorite player of the modern era, the inimitable genius Vassily Ivanchuk. As my small tribute and thank you to him, I have added him to this series. Those of you who have read earlier posts in this series will know that I usually have a natter about the subject's style and approach to chess, so here is my humble effort in that regard. Vassily Ivanchuk. As noted before, he is, for me, one of the few chess players in history that I regard as a genius. He also strikes me as a genuinely nice guy. In the ego driven world of chess, that means something to me. I could sit here until Thursday fortnight talking about the man's chess, but I will be as brief as possible, whilst saying what I think. Before I start, I would note that amongst other things he is a real 'fighter'. I always note that! So let's go 'phase by phase', so to speak. In the opening he is an all time great. I am seriously struggling to think of any player who has been capable of playing such a variety of opening lines, on both sides of the board, with such mastery as Ivanchuk. With Black, Petrosian comes close, but with both colors, I really can't think of anyone. His 'Best Games' in the Sicilian, for example, would be a book that I would save up to buy. I could say the same about his games in the Queen's Gambit Declined, and many others. As I say, he is pretty much incomparable across the whole of chess history in that regard. In the endgame - speaking as someone with a love of endgame play, he is simply superb - a fact often overlooked. He can both defend difficult endings brilliantly - as Nigel Short once found out, I think - and convert the tiniest 'theoretical advantage' in to a win. I have always held the opinion that players of exception natural talent have an inbuilt ability to play endgames well. However, for me, it is in the middle game that we see just how wonderful a player he really is. First of all he is an extraordinary inventor of ideas - right up there with Alekhine, Bronstein et al. One characteristic that I have noted is that he will often play things like Ra-c1, in Queen's - side openings, and then follow up with Rc1-c2, making room for the other Rook, whilst preparing to double on whatever open file becomes available. I have not noted this idea in the games of any other player. And he could do it against the very best. 30 years ago he beat Karpov and Kasparov in positional games in the same tournament!! The game against Kasparov in particular - I think Ivanchuk was around 20 years old at the time, which was young in the terms of the time - stands out in my mind. Kasparov was just squashed flat. An utterly humiliating defeat where Kasparov didn't get in a single punch. Just look at the position at move 36. .... NO-ONE did that to Kasparov!! I well remember his match with Leonid Yudasin. Yudasin was playing fine chess at the time. I was really looking forward to the match. It was a massacre!!! If I recall correctly it was best of 8 games, and Ivanchuk won 41/2 - 1/2. Yudasin simply couldn't cope with the depth of Ivanchuk's positional and strategic play. The game from the match that has most stuck in my head in that regard is the second one. It reminded me very much of Larsen - Ivanchuk came up with moves - his 9th, 11th and 12th, for example - that are surprising, and at first sight make no sense - but when you dig deeper, there is real positional understanding hidden behind them. One thing that stands out for me, as the featured game will illustrate when I eventually get to it ( I am not well organized, and just write whatever comes into my head!) is his extraordinary gift for handling utterly obscure, irrational positions. we often see 'randomised positions', but we can understand them in terms of base principles. Control the center, get an advantage in development, sacrifice to open lines, etc. Often in Ivanchuk's games there seem to be no positional 'signposts'. It is as if the pieces have just been dropped on the board - but he knows what is going on!! A remarkable gift. I once described this game along the lines of ' Not really a King March - more like, 'I'm just popping down to the shop to get some beers in to watch the match, if there is anything that you want while I'm there'. O.K. I had better put the feature game in before I forget what I am doing and waffle on forever! It is a game that is easy to follow with a computer engine running in the background, but there were no such things back then. I had the bare game score in front of me, and a wooden chess set and a4 notepad in front of me while I tried to understand it. I like studying games that are not so easy to understand! The game is quite well known now - you can find it on youtube, for example - but at the time it was new to me, and simply took my breath away. Vassily - I hope that you enjoyed your birthday as much as I have enjoyed the many hours that I have spent studying your games. You are a more than important part of the chess legacy of The Ukraine, which I respect greatly. Just a huge thank you from me. Respect and humble thanks. Simaginfan.